Bilyaletdinov (above, in tie) is using his international and NHL coaching experience to change Russi’s outdated approach. There are 88 delegations competing in the five-ring circus that is the Winter Olympics, and so there are nearly as many visions of the existential meaning of Sochi 2014. For Austria, the Games are one big ski hill. For the Netherlands, they are a speedskating meet. Viewed through the prism of the host nation, the Olympics are a hockey tournament; everything else is basically Lycra and sequins. Ice dancing twirlers and full-throated curlers, aerial tricksters and snowboard hipsters . . . they are all spear carriers in a grand opera that climaxes with the last event, the men’s hockey final on Feb. 23 at Bolshoy Ice Dome. “This is unfair to all other athletes,” says Igor Larionov, a Hockey Hall of Famer who won two gold medals for the Soviet Union in the 1980s, “but if Russia wins hockey and no other medals, this Olympics will have been a success.” Seven years in the planning and 17 days in the execution, Russia’s $50 billion winterlude will be distilled into 60 minutes—assuming Team Russia even gets to the final. The home team is no lock. Since the dawn of the Olympics’ NHL era in 1998, the six traditional hockey powers (Canada, the Czech Republic, Finland, Russia, Sweden and the United States) have all reached at least one final. Russia has won two medals, though never gold, losing to the Czechs in the final in Nagano in ’98 and finishing third in Salt Lake City in 2002. Given Team Russia’s firepower during this stretch—Pavel Bure, Sergei Fedorov, Pavel Datsyuk, Ilya Kovalchuk, Alex Ovechkin and Evgeni Malkin—this is thin gruel. The comforts of home ice in Sochi, the 200-by-100-foot international ice surface compared to the narrower (by 15 feet) NHL rink used in Vancouver four years ago, will offer some advantage, but the Russians have not exactly been Zamboni-ing the world in major hockey events in their country. Since ’00 Russia has been the host of two world championships and two world junior tournaments. The result: three bronze medals. 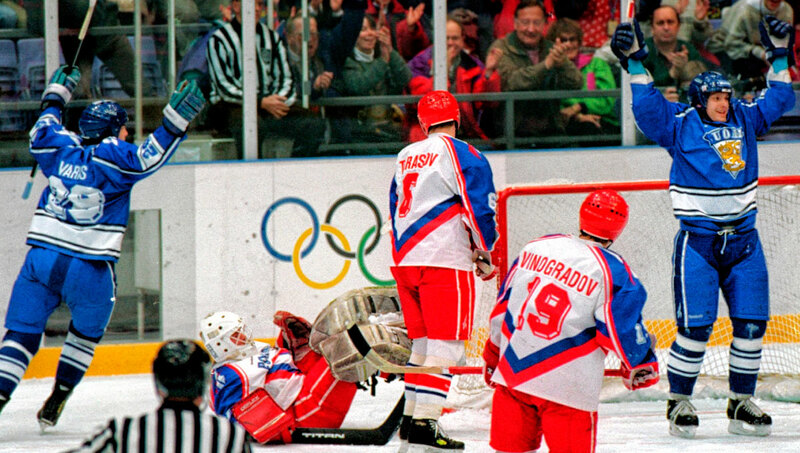 Given giddy Olympic expectations (Bure proclaimed Russia the “indisputable” favorite) a bronze tint to the home team’s performance in Sochi would vaguely resemble the color of dirt. Seven years in the planning and 17 days in the execution, russia’s $50 billion winterlude will be distilled into 60 minutes—assuming Team russia even gets to the final. Since the formation of the first Soviet hockey league in 1946 a gold medal match featuring Team Russia would be the most significant game ever played on Russian ice. (The decisive Game 8 loss of the ’72 Summit Series in Moscow? Not even close. The Soviets, technically amateurs, had already proved they were Canada’s equals.) The quest for the country’s first Olympic gold since 1992—the shards of the Soviet Union, known as the Unified Team, beat Canada 3–1 in the Albertville final—would be tense even if there were no emotional embroidery. But the vise has been tightened because of Russia’s embarrassing 7–3 loss to Canada in the quarterfinals in Vancouver four years ago. 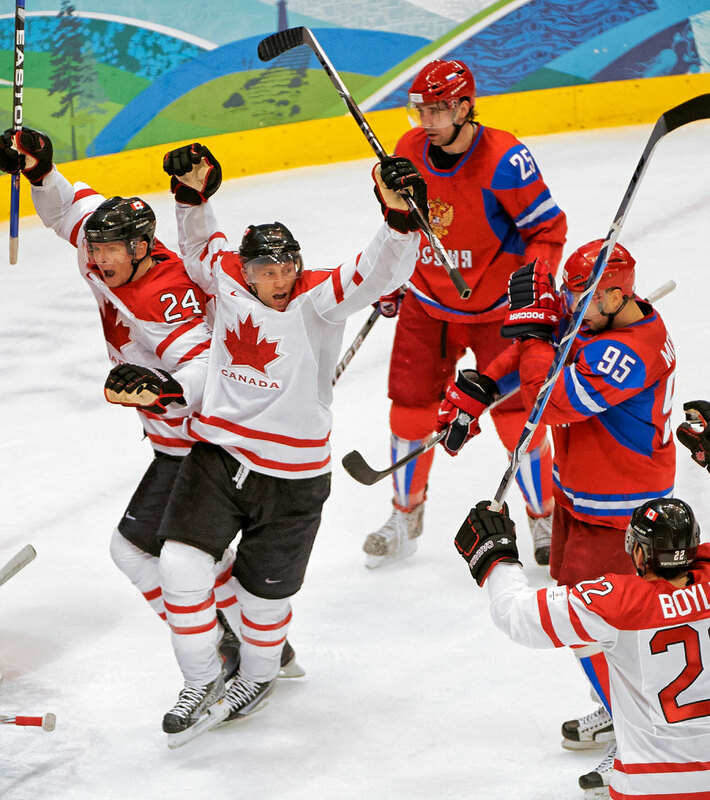 The Canadians, in the slam poetry of backup Russian goalie Ilya Bryzgalov, burst onto the ice “like gorillas coming out of a cage” and inflicted a defeat seared deeply into the soul of Russian hockey. 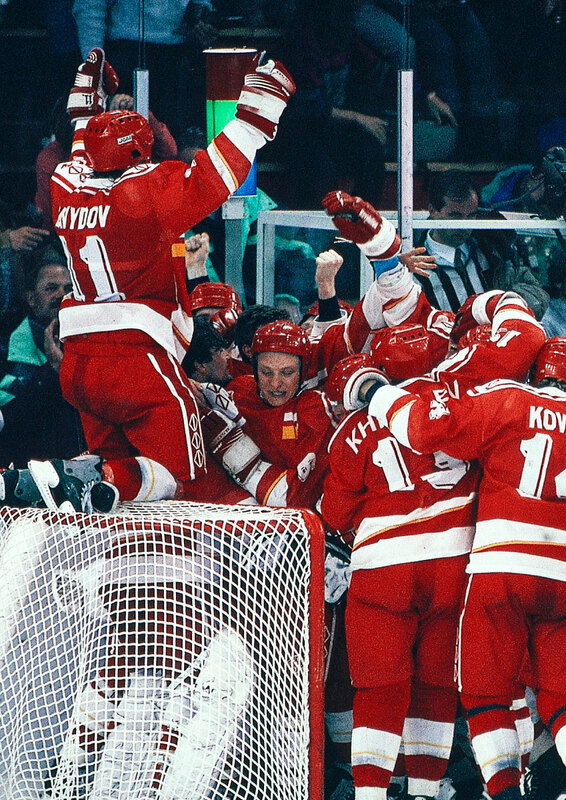 A timeline of Team Russia’s Olympic fortunes since the fall of Communism in 1991. 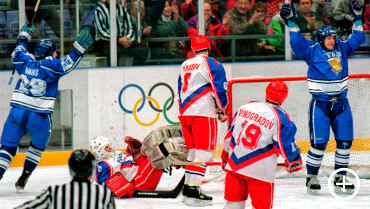 Playing as the Unified Team, Russia won gold by beating the U.S. 5–2 in the semifinals and then defeating Canada 3–1 in the gold medal game (above). Vladimir Putin, the shinny-playing president of the Russian Federation, laid his prestige on the line seven years ago when he went to Guatemala to lobby the IOC on behalf of a resort city on the Black Sea. As much as Atlanta in 1996 was the Coca-Cola Olympics, Sochi in 2014 will be the Putin Games. Presumably he anticipates nothing short of victory from Ovechkin and Malkin, who, when the NHL was being coy about whether it would allow its players to participate in the Games, repeatedly vowed to play in their home country even if the league would not. The Russians’ fourth-place finish ended with a 4–0 loss in the bronze medal game to Finland (above), to whom they had also fallen 5–0 during group play. In 2005, Putin called the demise of the Soviet Union “the greatest geopolitical catastrophe of the [20th] century,” but the death rattles in those tumultuous final days did not strike Russians that way, certainly not those who played hockey. Soviet hockey, in essence, was Russian hockey. Other than occasional outliers, such as flamboyant Latvian winger Helmut Balderis, the U.S.S.R.’s players were native Russians. The Soviet Union already had been cratering—by 1990 the three Baltic countries (Estonia, Latvia and Lithuania) had declared independence, and nine days before Gorbachev’s resignation Kazakhstan became the final Soviet republic to bolt—but there was no immediate sense that, from the new order, the Invisible Hand of Adam Smith, the 18th-century political economist, would ball itself into a fist and punch Russian hockey in the gut. In the first Olympics to feature NHL players (such as Fedorov, 91, and defenseman Alexei Gusarov) Russia lost the final 1–0 to the Czech Republic. 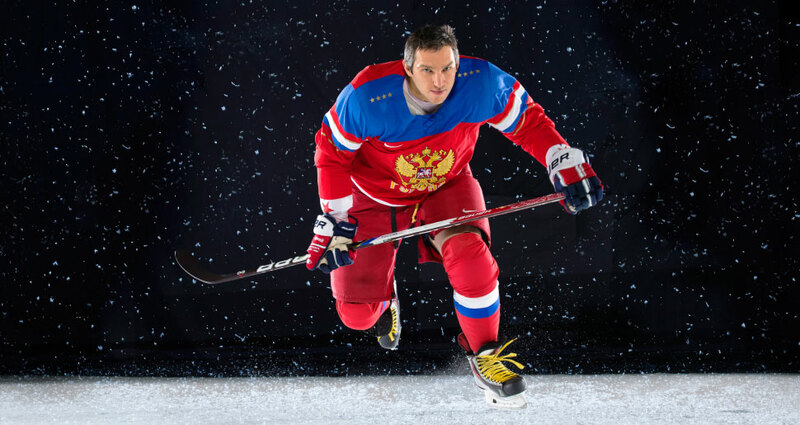 Liberated but not necessarily improved, Russian hockey was tiptoeing into the world of I-got-mine. Obviously the trait is neither uniquely nor universally Russian—Datsyuk is impeccably unselfish and Malkin is an exceptional distributor—but individualism was in vogue. Among the most dazzling soloists in those days was Alexei Kovalev, who scored 430 NHL goals in a 20-year career that ended in March 2013. Today it is Ovechkin who can beat an opponent all by himself, and who has been known to try. Larionov was the center on the U.S.S.R.’s famed Green Unit in the 1980s, an era when Soviet coaches would, according to Flyers assistant coach John Paddock, roll five-man units with little overriding “urgency to get their best players out there more.” There was something quaint in the approach, an echo of childhood when everyone got a trophy at the end-of-season banquet. In Sochi, at least Russia’s coaching will be all grown up. The adult in the room will be Paddock’s former assistant with the old Winnipeg Jets (from 1993 to ’95), a direct, occasionally dour and undeniably detail-oriented ex-defenseman who has worked both sides of the international street. His long résumé is trumped only by his longer name: Zinetula Khaidarovich Bilyaletdinov. Twenty-two years after the Unified Team, Coach Bil will have to unify a team. In failing to reach the podium, Russia was outscored 7–0 in its last two games, including a 3–0 loss to the Czechs in the bronze medal game (above). Bilyaletdinov was a Soviet national team defenseman until his retirement in 1988, a powerful skater, especially backward, who specialized in the fading art of the hip check. He played his entire 15 years with Moscow Dynamo, a background that will inform Team Russia’s style in Sochi. U.S.S.R. club teams represented elements of Soviet society. CSKA was the Red Army’s team. Dynamo belonged to the KGB. Because CSKA had its pick of players, Dynamo often had less conspicuously gifted forwards, a circumstance that obliged it to become a counterattacking team. “Tight system,” says Canadiens defenseman Andrei Markov, another Dynamo alumnus who will be playing for Russia in Sochi. Russia again failed to win a medal of any kind after gettng steamrollered 7–3 in the quarterfinals by eventual champion Canada (above). In the early 1990s, Winnipeg GM Mike Smith, the NHL’s leading Russophile, forged strong ties with Dynamo. The relationship included player exchanges. Smith invited Dynamo players to a Jets training camp in 1991, and Bilyaletdinov, then a Dynamo assistant, tagged along as a chaperone. Smith had admired Bilyaletdinov as one of the new breed of rugged Russian players. Now he was impressed with his coaching. “When you watch players getting coaching, either their eyes will get wider or their eyes will get narrower,” Smith says. “When Coach Bil was talking, players’ eyes got wider because they were paying close attention.” Smith hired Bilyaletdinov as an assistant coach in 1993. After spending ’96–97 with the Coyotes, he went home to coach Dynamo. Smith, later the Blackhawks’ GM, brought him to Chicago for most of the 2000–01 season, although, Smith says, coach Alpo Suhonen, who already had two assistants, did not want Bily­aletdinov on the ice during practice. European teams certainly did. Bilyaletdinov coached Lugano in Switzerland in ’01–02, returned for a second Dynamo stint and then took over the Russian professional team Ak Bars Kazan, winning a Superleague championship in ’05–06 and KHL titles in ’08–09 and ’09–10, as well as the continent’s club crown, the Europeans Champions Cup, in ’07. He also coached Team Russia for part of ’04–05. Following the Vancouver thrashing four years ago—Russian­ coach Vyacheslav Bykov looked overwhelmed behind the bench—Bilyaletdinov was reappointed to the job in 2011.
in advance of sochi, russia has finally entered the 21st century, emplyoing ex-NHL players igor kravchuk and nikolai broschevsky as north american scouts. 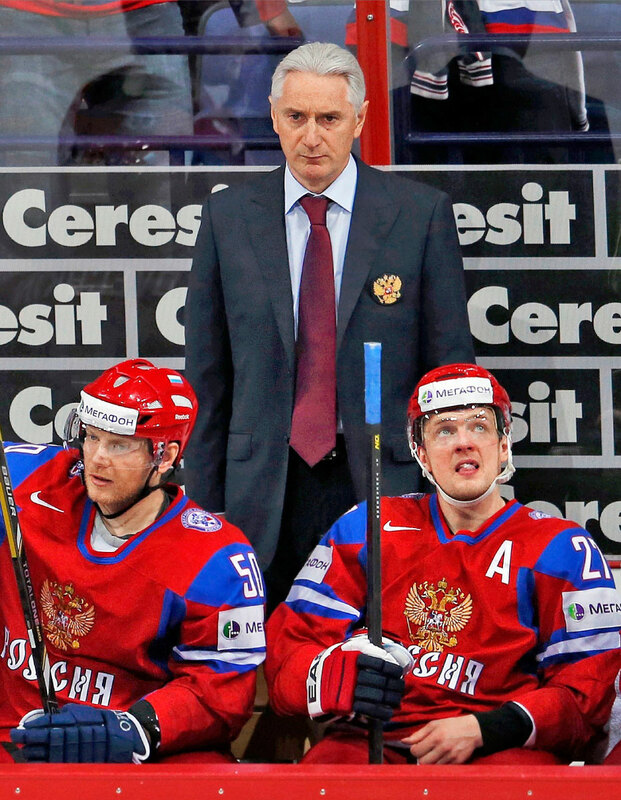 Organizationally, Russian hockey often has been a stride behind the rest of the game. In recent Olympics, the erstwhile Big Red Machine seemed to be running Windows 95. 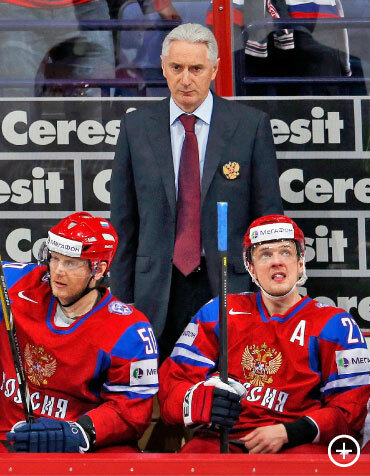 According to Kuperman, Olympic coach Vladimir Krikunov said before the 2006 tournament, “I don’t have to watch [Russian players] playing in the NHL. I just read game summaries and everything is clear to me.” The pre-Olympic scouting for 2010 was murky. “Bykov and [assistant Igor] Zakharkin did have a scout, but when the media asked who, they said, ‘It’s a secret,’ ” Larionov says. “It didn’t make sense to me: the unknown scout.” In advance of Sochi, Russia has finally entered the 21st century, employing ex-NHL players Igor Kravchuk and Nikolai Borschevsky as North American scouts. Bilyaletdinov, GM Alexei Kasatonov and Russian hockey federation president Vladislav Tretiak also toured the NHL, eyeballing Russians but also scouting opposing players. Four years ago a disjointed Russian team had 14 players from the NHL and nine from the KHL. In Sochi, the split is 16 and nine. No other favorite will be obliged to blend as many players from the world’s top two professional leagues. “Zinetula Khaidarovich has a knack for this,” says Kovalev, using Bilyaletdinov’s patronymic. Hurricanes winger Alexander Semin, after playing on Russia’s gold medal team at the 2012 world championship, praised Coach Bil’s emphasis on discipline and puck possession to RIA Novosti, a Russian news service. Semin, a former 40-goal scorer with the Capitals, was initially not picked for Sochi, but was added as an injury replacement on Jan. 21. At first pass, the Maverick Semin was not Coach Bil’s kind of player. “my view is, [bilyaletdinov is] an nhl coach who happens to be coaching the russians,” says the blues’ ken hitchcock, a Team Canada Assistant. Team Russia has a cavalcade of all-universe forwards, including Datsyuk, Kovalchuk, Malkin and the irrepressible Ovechkin, the NHL’s leading goal scorer. Regardless of how Bilyaletdinov deploys his wingers, the lines centered by Datsyuk and Malkin are matchup nightmares. But the other forwards are not so easy on the eyes. The top defenseman is Markov, who is clever but is also a step below the best blueliners for Team Canada. Goaltending has often ­disappointed—“Since Vladislav Tretiak left the sport [in 1984], we’ve always had problems with the goal,” says Boris Mikhailov, captain of the 1972 Summit Series team—but the Russians have a credible pair in Sochi. Sergei Bobrovsky of the Blue Jackets was the best goalie in the lockout-shortened 2013 NHL regular season, but the Avalanche’s Semyon Varlamov, whose save percentage has been significantly higher than Bobrovsky’s in ’13–14, is the presumptive starter. If Russia plays the Coach Bil way, success might come down to one save. The 58-year-old coach has accepted challenges before. (In Winnipeg, Bilyaletdinov spent hours trying to refine the skills of willing but ham-handed defenseman Brent Thompson.) He has a philosophy, and unlike the seemingly overmatched Bykov, a clue. “My view is, he’s an NHL coach who happens to be coaching the Russians,” says the Blues’ Ken Hitchcock, a Team Canada assistant. Now Bilyaletdinov merely has to negotiate a field that includes stacked Sweden, dangerous Team USA and defending champion Canada, and, on Feb. 23, triumph in the $50 billion hockey game. A nation waits. Putin watches. If Coach Bil delivers, he will be the toughest mother in all Russia.